Woodrite craft and manufacture timber garage doors as part of their 'Coach House' range, with your requirements and specifications as their priority. Although established in 2010, they claim to have over 30 years of experience within the industry and, with a clear desire to provide bespoke garage doors of only the highest quality, Woodrite provide the ideal product and service. 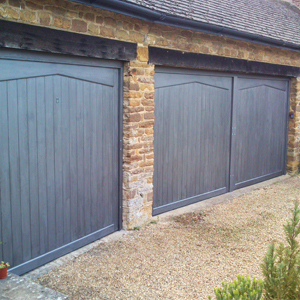 Their range consists of bespoke timber garage doors that can be manufactured as either Up & Over or Side-Hinged doors. So - why choose Woodrite? 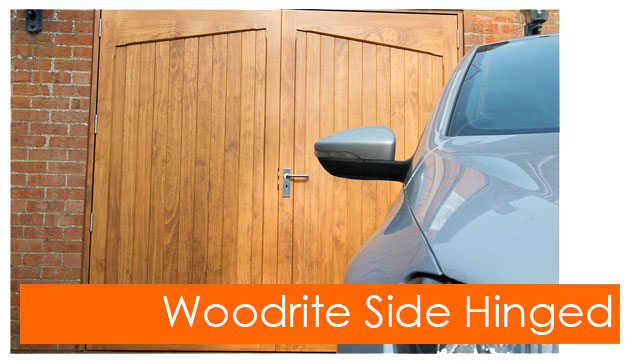 The sheer size of the range that Woodrite produce for their customers is incredibly vast, and in addition to their standard and bespoke designs and sizes, Woodrite can ensure your garage door will be tailored to the specifics of your taste. 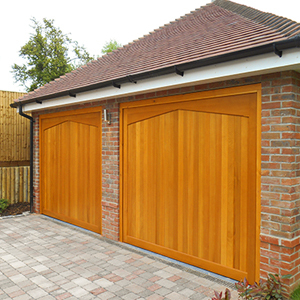 As Woodrite recognise the remarkably versatile qualities of timber, they establish the necessary care that is required to manufacture their garage doors with it. They even go to the hassle of turning each and every door upside down when it is applied with finishing coats. As a result, Woodrite are ensuring that every inch of the door, including the important mouldings on the bottom, are treated sufficiently. Cedar - Being light in weight, Cedar doors make for easy operation, yet protect themselves against the ever-changing British weather. Warm in colour, cedar doors possess a homely aesthetic. Oak –With not only a traditional aesthetic, oak is also of such a weight that only traditional designs are available, ultimately creating a classic garage door. Idigbo – An ideal choice if you require a door of stability for boarded, and raised and fielded designs, which also is exceptionally similar in appearance to oak. Accoya® – A timber that boasts exceptional qualities of strength as a result of its “super-technology”; Woodrite garage doors that are made of Accoya® possess a 10 year finish warranty. If you know which door type you require, you are able to browse by door type below. 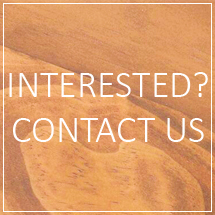 Alternatively, browse Woodrite's products by timber species and ranges, all of which consist of different designs and types of timber. 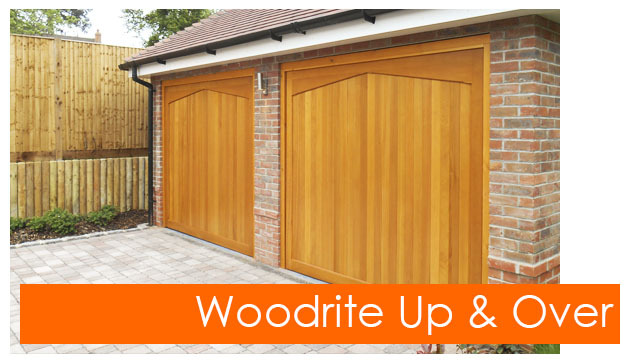 Woodrite manufacture Up & Over, Side Hinged and Personnel doors, meaning you can match your garage doors to any side doors with the promise of both quality and authentic style. Woodrite currently have six ranges spanning across their Up & Over doors, each dedicated to a timber species including: Cedar, Oak, Idigbo and Accoya®. Each door is carefully hand crafted with mouldings of the relevant timber species, and is turned up side down to coat the entirity of the door in treatment, improving the timber's properties and durability. There are three ranges dedicated to Cedar as a species, however they differ in how they are built, and therefore in their final appearance also. The Warwick, Monmouth and Thetford ranges consist of Idigbo, Oak and Accoya® doors respectively. Please see below for the individual ranges of Woodrite's Up and Over doors. Woodrite's York range consists of side hinged garage doors that are carefully hand crafted by the Woodrite team with cedarwood. In comparison to up and over garage doors, side hinged doors offer useful properties in regards to easy access on both foot and via vehicle. The York range comes with various designs, and can often convey a more traditional aesthetic, as well as a sleek appearance on the inside when compared to up and over doors. See all Woodrite ranges below. Along with their range of Up & Over and Side Hinged garage doors, Woodrite also craft and supply personnel doors to match, creating a beautiful harmonisation of timber for your home's facade. The doors are a perfect match to the York side hinged doors, their features are simply scaled down - they can however, be matched to both the side hinged and up and over garage doors. The door's edge-to-edge timber and traditional build method make for sleek, traditional personnel doors for simple pedestrian access. Woodrite's timber species include Cedar, Idigbo, Oak and Accoya®. Click on the buttons below to find out more about the species and their ranges! The Somerset range part of the Coach House collection represents the finest of its kind, hand-built in cedar and finished to exacting standards. The Balmoral range is hand crafted in cedar mouldings, cedar tongue & groove boards, raised & fielded cedar panels for timeless appeal. The Buckingham range of wooden garage doors is hand crafted in cedar mouldings, and cedar tongue and groove boards for timeless appeal. The Monmouth range is hand crafted in oak mouldings, oak faced exterior grade ply for the unforgettable appeal of a natural oak garage door. The york range of side hinged wooden garage doors hand crafted in cedar mouldings, tongue & groove boards, cedar faced ply and raised and fielded cedar panels for timeless appeal. The personnel wooden door range hand crafted in cedar mouldings, tongue & groove boards, cedar faced ply and raised and fielded cedar panels for timeless appeal. For such a high quality timber door to be manufactured, certain levels of care are required before use. Wood is an incredibly versatile material and, with the correct approach, is unequalled; Woodrite's treatment and service during the manufacturing of their doors significantly contributes to their excellence. Additionally, 90% of Woodrite's doors are fully factory finished, proving that such an option is a highly desirable addition. Woodrite’s attention to detail is a vital asset for the quality of their doors and, after many years spent working with timber, the team knows exactly how to perfect their work first time. Whether the team are working with cedar, oak or other classic hardwoods, each of their natural qualities are enhanced due to the caring treatments that they receive. 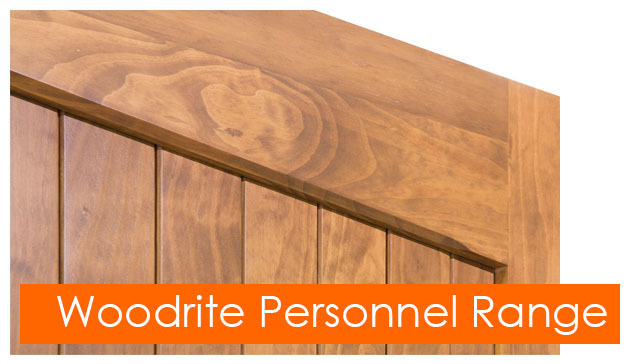 What makes Woodrite's Doors High Quality? Hardwood products are typically expected to last for around 50 years in external service, with sufficient maintenance adhered to; Accoya® should add an additional ten years to this service life. Woodrite door's hard and consistent structure produces a much finer finish after sanding, and the lack of absorption of water from the paint means that the final finish is of a more advanced quality than hardwood. An ever greater finish can be made possible by undergoing a grain fill process prior to painting. The hard qualities of the timber makes it less susceptible to damage, therefore increasing the likelihood of maintaining the paint-coating in the long term. With this in consideration, the longevity of the products is improved; the timber can be grown in 25 years, but can last 60 years whilst in application, making it a net absorber of CO2 and an incredibly green building material. 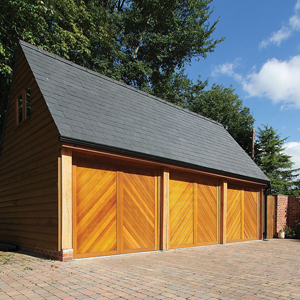 All Woodrite timber garage doors are built to order from Grade 1 selected cedar/ idigbo tongue and groove boards, cedar/ idigbo/ oak/ Accoya® mouldings, cedar/ oak faced ply and cedar/ idigbo raised and fielded panels depending on style. All boards are individually dipped in a base coat to ensure penetration into the end grain and grooves.These wooden garage doors are available in a wide range of standard sizes and special sizes that can be made to measure. Throughout the various ranges, Woodrite allow for great customisation, including the option to have your door built with narrow or wide boards. Woodrite doors are also available with optional frames which are constructed from galvanised steel; these can be finished to co-ordinate with the appearence of your door. A selection of windows are also available as an additional extra. The windows can either consist of plain or leaded glass and are made from stippled polycarbonate, which allows sunlight into your garage whilst also preventing being able to see into it. The team appreciate the unique appearence of every timber door, and therefore understand that doors are constructed of the same species can be of lighter or darker shades because of their natural qualities; it is important to remember that samples may vary from the specific colour of your door, however the details of this can be discussed during the process. Have you find a Woodrite door that you like? Do you have any questions? 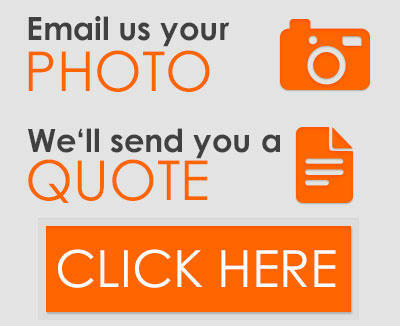 Give our expert team a call and we can guide you through the necessary process for you!! We have a showroom based in Northamptonshire with an extensive range of garage doors, entrance doors and accessories - come and see for yourself!